The grand finale of my ModCloth swimsuit review series is here! In this installment I am reviewing 5 swimsuits. I am continuing to show you front and back angles and to do my small part to destigmatize cellulite. People with and without cellulite look great in swimsuits. Please don’t let some dimples and ripples stop you from enjoying summer activities. Let’s recap: ModCloth sent me eight swimsuits of my choice to wear this summer. I decided to review these on Jamie JeTaime in a three part series. The reason I chose to do this review style is because many people ask me where I get my swimsuits and sizing specifics. I don’t mind answering these, but I do think having it in one place while you are swimsuit shopping would be a lot easier on you. You can find my first one here where I share my measurements and review a swimsuit and a review of two more swimsuits here. Also I feel it is important for plus size people to get images of them them in bikinis on the internet. Many of us do not have representation of our bodies in the media. I also tried on a few sizes of each swimsuit to test for the best fit and I will share that with you too. Without further ado here are the photos & reviews! What am I wearing? The Support Coastal two-piece from ModCloth. 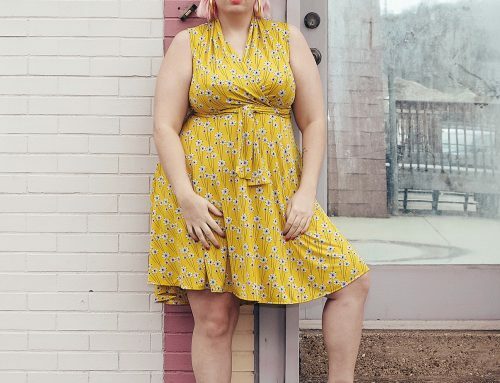 This is from ModCloth’s own High Dive Collection. It is available in sizes S – 3X. I am wearing a 1X in the top and a 1X on the bottom. The bikini top: I am wearing a 1X. Unlike other High Dive bikini’s this top is not adjustable. I was pessimistic that it would work for me. Not only does it work, but I love it! This could also stretch to fit a larger rib cage. The bottoms: I am wearing a 1x. Why did I choose this suit? Vintage stripe dreams come true! Impression: Comfortable aesthetic perfection! Would also look nice with roller-skates. What am I wearing? The Sunlight Showcase two piece from ModCloth. 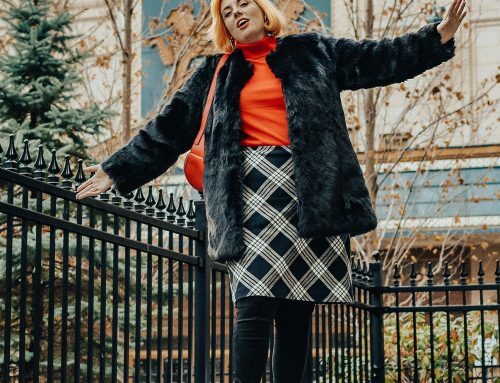 This is from ModCloth’s own High Dive Collection. It is available in sizes XS – 3X. I am wearing a 1X in the top and the bottom. The bikini top: I tried on an XL in the top, but the cups were too small for me. The 1X fit perfectly! The top band and straps are adjustable. I am wearing the band on the tightest adjustment, so if your rib cage is a bit bigger than mine this size would work too. The top has fantastic support and has optional removable foam cups. The swimsuit has multiple strap options: halter, shoulder straps, both, or strapless! I find shoulder straps most comfortable for me. The bottoms: The 1X fit perfectly. Why did I choose this suit? She wore an itsy bitsy teenie weenie yellow polka dot bikini! I have been hunting for a yellow polka dot bikini for years. I had one when I was about four years old. I remember wearing it while dancing in the rain. Impression: SO much fun! Perfect for bicycling! Watch this YouTube video to see multiple angles of the this swimsuit! What am I wearing? The Delight on Deck in Mint one-piece from ModCloth. It is available in sizes XS-4X. For years I couldn’t find a one-piece that fit my long torso. Through trial and error I discovered a trick that works my long torso: Swimsuits, like this one, that do not provide shaping (such as tummy control) generally have more stretch and will often stretch to accommodate longer torsos. I also sometimes size up like I did for this one! I reviewed another one-piece last week. Sizing: I am wearing a size 2X. I sized up for my torso length and it is a great fit. Why did I choose this suit? This reminds me of a vintage swimsuit I bought at a yard sale in high school. I was quite sad that it didn’t fit me. I gifted it to a friend who I knew would wear it. I always dreamed to have a suit like that in my size. This suit reminds me of that swimsuit. It isn’t exactly the same, but definitely gives a respectful nod to that vintage suit. Impression: Super comfortable! It isn’t lined, which I prefer. If you want some trimming action, this suit isn’t going to provide it. Definite plus in my book. What am I wearing? The Vacation Daisies in mint two piece from ModCloth. 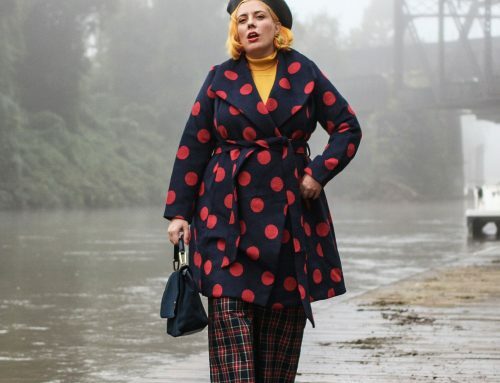 This is from ModCloth’s own High Dive Collection. It is available in sizes XS – 4X. I am wearing a 1X in the top and the bottom. The bikini top: I wear a size 1X. The top band and straps are adjustable. I am wearing the band on the tightest adjustment, so if your rib cage is a bit bigger than mine this size would work too. The top has fantastic support and has optional removable foam cups. The swimsuit has multiple strap options: halter, shoulder straps, both, or strapless! I find shoulder straps most comfortable for me. The bottoms: The 2X was slightly loose at the narrowest part of my waist, so I opted for the 1x. I could have worn either size though. Why did I choose this suit? The mint green! The daisies! Also I like mint green with my pink hair. Impression: I go back and forth between what my favorite swimsuit is. This one mostly reigns on top. What am I wearing? The Parasail with Me in Lemons two piece from ModCloth. It is available in sizes XS – 3X. This suit runs very small! The bikini top: I tried on a 1X in the top, but I couldn’t even get it on. I require a 3X in this one. In my experience, it fits very narrow. It isn’t an adjustable top. Why did I choose this suit? LOOK AT IT! The colors! The fruit! The cut! Impression: Once I found the correct size, I am totally in love with this suit! I don’t have anything like it! It is so much fun! I reviewed the following ModCloth swimsuits in previous posts: ModCloth Swimsuit Review Part 1 and Part 2. Here are most of the swimsuit’s I reviewed on ModCloth ‘s models. What are your concerns in finding a swimsuit that fits your shape or style? What do you want to see more of? 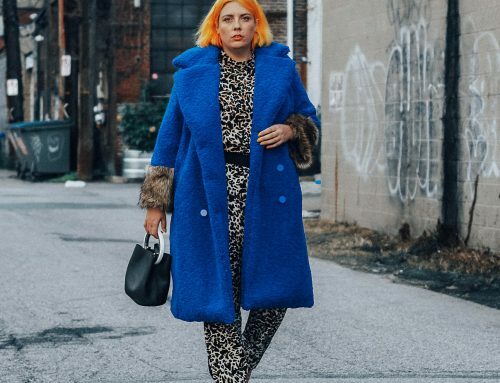 As always feel free to use #FashionIsMagic on Instagram to share with me what you are wearing! ***A special thanks to my partner, Kevin, for photographing me everyday & to ModCloth for supporting body positivity through great fashion at a variety of sizes. THE LEMONS!!!! 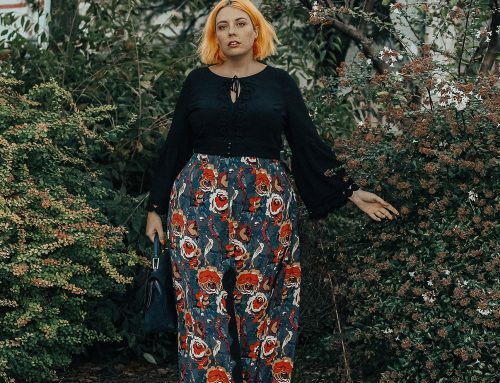 You’ve inspired me so much Jamie, for realsies – Ive been avoiding short shorts and swimsuits for ages because of my dimply pasty thighs….but for why??? For other people??? Eff that! If we as the bopo/plussize community don’t work to destigmatize things like cellulite or rolls then who will?! I’m going to go put on the shortest shorts I own right now! Also, seriously, THE LEMONS!!! Would you like some lemons with your dimples? 🙂 I used to only post photos where my cellulite was only kinda showing. It changes in different light. I thought to myself this so so freaking silly to be like dimples and ripples in other people, but not myself! Thank you for your comment! You are rocking these swimsuits! Love the yellow polka dot one ! Thanks, Leah! The Vacation Daisy would look great on you! I’m living for that yellow suit! I’m loving for that yellow one! This is a great series! 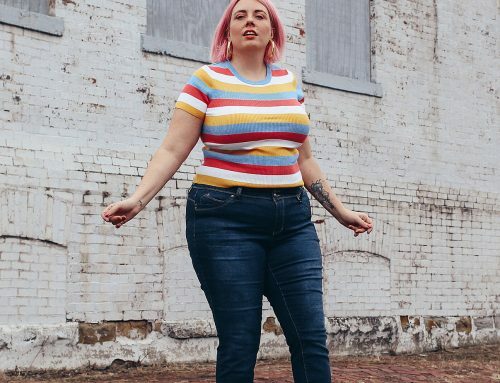 I love that Modcloth is not only making inclusively sized swimsuits, but also reaching out to body-positive bloggers! I do wish that they made more swimwear for those of us with larger chests! As someone with a small band size and a large cup size, I have a really hard time finding swimsuits that work well. (I’ve had the most luck at ASOS since they have a ton of bra-sized swimwear.) Also, that daisy suit is AMAZING!! Thank you so much! I definitely hear you on the small band larger cup size! I was a 34F last year and I have gained weight so now I am a 36G. It’s a bit easier finding bikini tops that fit now that my band size is larger. Thanks for the ASOS tip, I wasn’t aware they offered bra-sized swimwear! This was such a good idea. I’m so glad you did this because I have been wonder about Modcloth’s sizing. I just need to go ahead and order from them. Thanks love!